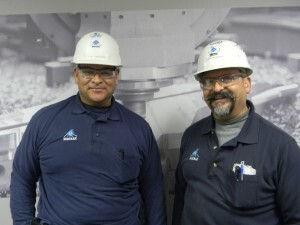 At the trackwork plant of voestalpine Nortrak in Chicago Heights, IL, it’s a family affair. The Desiderio family is just one example of many family units working together. Juan worked in many jobs as the company changed hands and was promoted to supervisor in 2002. "The Company helped me go to college and gave me $500 when I got my diploma." This helped him to become a US citizen in 1993. It was a big day for his family. He was given a jacket that reads ‘USA’. He still has the jacket and a copy of that check. Fidel Desiderio, supervisor of the Turnout, Frogs and Crossing departments, is Juan’s youngest brother. He came to work at Nortrak (then ABC Rail) in 1986. “When I applied for the job, Juan warned me ‘Don’t let me down’ and I’ve never forgotten those words.” Fidel was a Frog Fitter and held many other positions before learning to run a CNC machine. He was promoted to Supervisor in 2004. Six of their 1st cousins – Braulio, Cirilo, Francisco (l/n Hermosillo), Jose, Julian and Nate, five 2nd cousins – Alex, Andres, Leo, Julian Jr and Paulo (l/n Hermosillo), one nephew – Adrian and one child work for voestalpine Nortrak; some for 2 years and others for over 25 years. "We are always excited to hire friends and family. We believe this is a major factor in the high level of commitment shown by our 225 employees as well as the low turnover we experience." When it comes to working for an Austrian company, Fidel and Juan are both happy for the stability and the investments in our people, equipment and facilities. "Every day is a challenge but you have to love your job."